Steven (Chicagoland, United States) on 15 October 2013 in Architecture and Portfolio. The Custom House and Old Post Office is a historic site located at 281 Front Street, Key West, Florida, United States. On September 20, 1973, it was added to the U.S. National Register of Historic Places. 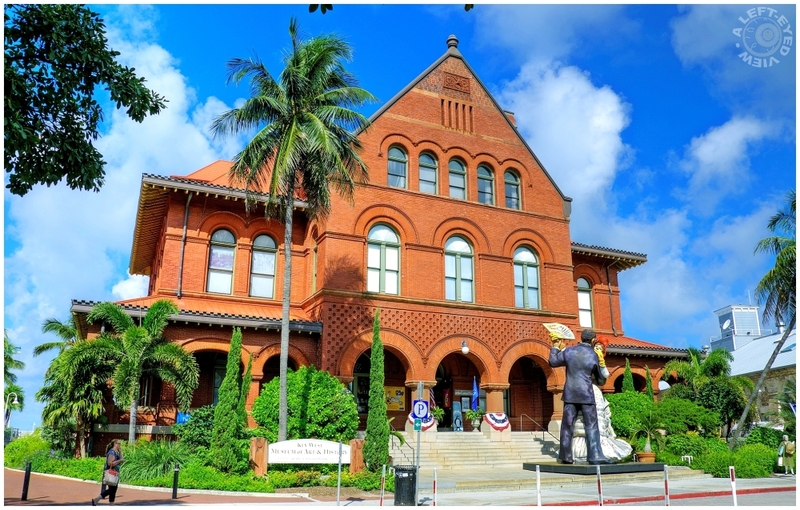 The Custom House currently serves as the Key West Museum of Art & History, which is one of three museums operated by the Key West Art & Historical Society. Exhibits include local history, famous personalities including Ernest Hemingway, maritime history, and works by local artists. The building was designed by architect William Kerr, and was completed in 1891. The United States District Court for the Southern District of Florida met here from its completion until 1932, when the building was transferred to the United States Navy. Oh! These colors are wonderful. And they conform a splendid image with the combination of such level of detail. Nice looking place, yet even as a late 1800s building it looks relatively modern - must be those bricks! Des couleurs et une lumière splendides. Superbe cliché. Bonne journée. Beautiful processing, Steven - I'm loving the colors here. Well done! Beautiful composition and great colors ! Very nice shot and building ! i like the angle and the material! and i like the larger-than-life figures at the entrance! I recognize those sculptures in front as the work of an artist local to me - J Seward Johnson. He has sculptures throughout this museum. Lovely image - the light is beautiful. What a fantastic image, Steven ... I love it! A beautiful building. Gorgeous color. I love how it contrasts with the beautiful blue sky! I really like the architecture. Very beautiful and attractive structure ... great vibrant colors too! Nice building under a lovely sky. A fantastic composition Steven !! Nice to see and great history too !! Very nicely shot. That is a great looking old building. A wonderful shot of this interesting and beautiful building. The rich colors are a delight. What a beautiful old house to make into a museum. Nice and low POV to showcase this attractive building against a gorgeous blue sky.